Drat! They are SOOOO selfish! What's the point of hiding photos now that we already have them? 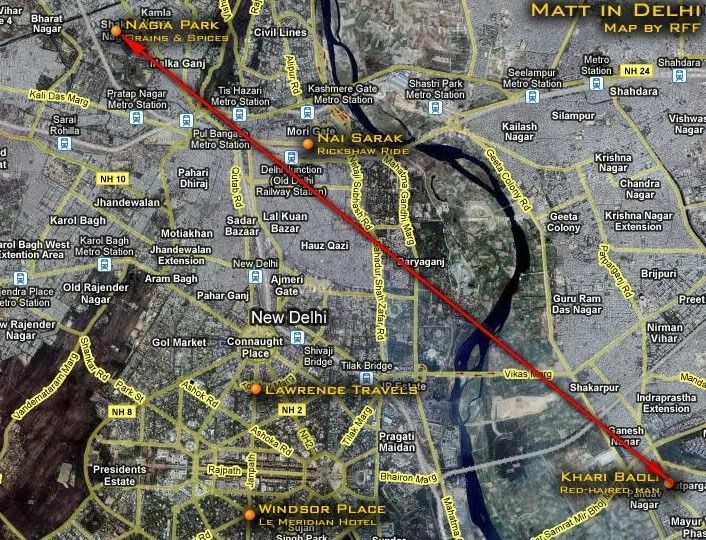 "Nai Sarak, Delhi" on Google, and another sign in the next photo seems to confirm that. The red-haired man location came from a sign in the background as well (how helpful!). ETA: Is this the cow? "Neobie got the cow" just went down in the RFF annals for best quote ever! Don't forget to put the beef on the map! Oh frika frak, frik, frik, frik. I must be blind. I should have known, that was too easy of a find. Oops, wrong cow, guys! Sorry 'bout that! Here's the real hookah, 'cos there's this to back it up this time! Matts "little red church" (aka All Saints Church not far from Red Square). Matts "little red church" (not far from Red Square). Good job Boingo !! Is that everything now? If so I'll be waiting on my "this is where Matt's been in Moscow map"
note: Small red All Saints Church is directly across from Cyril & Methodius Monument (push-pin resoultion lost at this scale). Kremlin locations all bunched as "Red Square"
Stealing your map too please! ? Now...What do we think? Did Matt go places there will be a task? Or was he aimlessly sightseeing? Oh Boingo , you guys are spoiling us . Peach, the report from Portland on arrival of the Finale teams was that they had originated in Moscow. That makes it logical that Moscow is indeed a pitstop. It's the teams that matter. Heee...I KNOW it was a pitstop! I'm just wondering if the places Matt visited in Delhi and Moscow will turn out to be challenge/task locations, or was he just sightseeing? Since the photos really focus in on the sledge, the HOOK, and the large grain sacks--I'll bet they are doing some hauling! I thought so too...but why are they so far apart? Could he be about something else entirely? Maybe the rickshaw ride is on the way to see Redheaded man? Yeah, production gets a rickshaw and the contestants might have to hoof it? Thats what I'm thinking. Matts pix of Bulgakov Museum doorway and similar doorway in same area. Everything you ever wanted to know about the Bulgakov Museum in Moscow. I have news from La Paz!! sorry I didn't reply earlier, we didn't have any internet access for the last 10 days. As for your questions, it's a bit hard to remember (as I'm not as obsessed by details as you guys are!) but we are rather certain we saw the Amazing Race on May 28th in La Paz. They were in Plaza Abaroa (sometime called Plaza Avaroa), in the neighborhood of Sopocachi. From our apartment, we also noticed a lot of commotions and big tv lighting in the parc of the Monticulo, near Plaza Espana. I am like 80% sure the sign said U-Turn but as soon as I shouted "Oh my god it's the Amazing Race" some of the workers covered the sign. I know it wasn't one of those thing where you can put the picture of another team. So just a big yellow sign with the flag beneath it. What else... 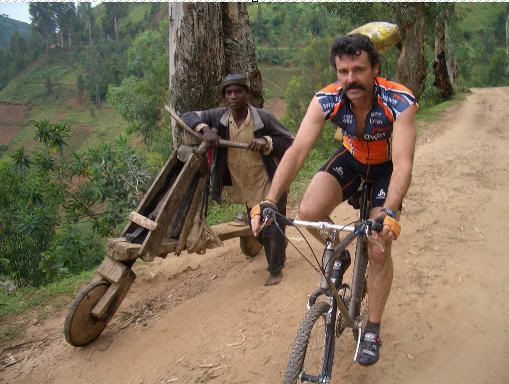 The bikes were similar to the ones on the picture you sent but less shabby looking. And they were next to wooden head gear with lots of feathers on it. I didn't see any teams. Oh, but also, there were lots of brass bands typical of Bolivia. I'm not sure why they were there. But there was more than one band, that's what caught our attention first because we thought there would be a parade. I'm afraid that's it! Hope this helps your curiosity! Sorry there were no pictures taken. And a HUGE thank you to C&W for the nice reply!! Originating from the Amazonian lowlands of Bolivia; the dance commemorates the clashes between Incan and Amazonian warriors. Tobas is noted for their spectacular masks, costumes and feather headdresses. The dance consist of jumping rhythmically to the sound of drums. 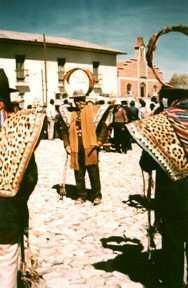 The origin of the morenada goes back to the employment of black slaves in colonial Potosi, where the miners to replace the indigenous mitayos (pawns) bought them. A satiric dance whose steps mimics the movement of the slaves that squashed grapes to make wine in colonial times. 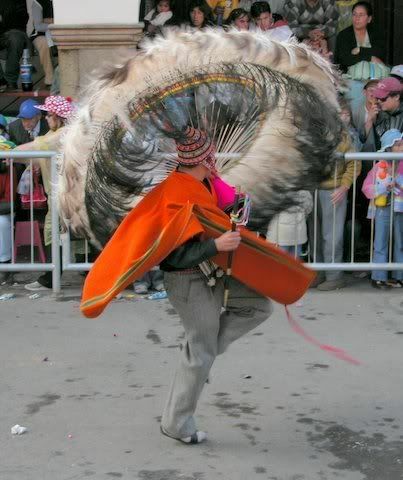 The male dancers wear a cape artistically embroidered with geometrical shapes and stones,along with a hat made of metal adorned with ostritch feathers, a curly wig, a mask with a thick lower lip. The festival was at once the most entertaining, bizarre, disturbing and moving pageantry I have ever witnessed - this despite the repetitiveness of the music. It was entertaining because of the variety of costumes and dance. Bizarre because of the vehicles in the parade which were adorned with jewels, coins and silver service. Disturbing because of the extent that real feathers were used as part of the costumes, and moving because of the pageantry that took place in a cathedral that was part of the first evening's events. The most famous of the Diablada dances is "La Morenada" which is a re-enactment of the dance of the African slaves. When I heard the steady clomp of wooden shoes with spurs coming down the street sounding eerily like the chains the slaves had to wear during their years of servitude in this part of the world, it sent chills down my spine. I got into a few conversations with English-speaking performers behind the scenes who were wearing natural feathered headdresses, some cascading to the ground. We discussed the use of these feathers as part of their costumes and what it meant to the wildlife in their jungles. All agreed that this extravagance couldn't continue much longer. The afternoon of the first day of the parade I followed the route to the end, curious as to what scene I would find there as the participants finished their performances. At the top of a hill in an open square I watched as performers, one-by-one, remove their head covers and masks, hats, plums, and then disappear into a large cathedral. I was not prepared for the spectacle I was about to encounter inside the edifice. It was as if the church silenced the brass band that accompanied them. The silence was deafening. All had made their way to the front of the altar where a priest in full dress was blessing them en mass as they kneeled. I stood transfixed, looking out from the side of the altar at a sea of costumed mestizos and Indians. Their feathered headdresses and devil's masks were cradled in their arms. Their spears were standing tall against the vaulted ceilings. Following the brief ceremony, the brass band started playing again and continued while they approached the altar. Each person kneeled on the altar platform and slowly shuffled along it on their knees while solemnly gazing at the painting of the Virgin above. I can still see devil's masks moving slowly along the altar in the arms of the bearer while he or she gave reverence to the Virgin. I left the cathedral that evening impressed with the degree that these people were moved spiritually. The next day this ceremony wasn't repeated. Nor was it the following Saturday at the next carnival I attended in nearby Cochabamba. I asked a dancer there why I had experienced this spiritual outpouring at the Oruro event and not at the Cochabamba one (which I observed to be more homespun). She said, 'The dancers in Oruro were dancing for the Virgin, the ones in Cochabamba were dancing for the Carnival'. I accepted the fact that I could only understand this difference by immersing myself deeper into Bolivia's rich culture. All day and into each of the two nights parading brass bands blasted out the dynamic morenada music. Early in the morning of the second day Muriel, Stef and I attached ourselves to a dance group and snaked our way with them through town. As we moved along more and more people joined us, all dancing in rows arm-in-arm. An inclusive thought prevailed with this activity and nobody was considered an outsider. We all laughed and cajoled together at the end three hours later before parting ways. It made me realize how welcome a person could feel at this event even if they were alone. Wonder if one of our detours is bikes and one is dance Ala Kynt in Vinci last time?